The Galaxy Note line has established a reputation for being the bleeding-edge phone in Samsung's lineup. It was the first to offer a big screen — before phablets became in vogue. It was the first with multiwindow software for running two apps side by side. And it was the first to do a curved edge screen. The new Galaxy Note 9 (starting at $999) packs some firsts of its own, including an S Pen that doubles as a remote control. But after spending some hands-on time with Samsung's new flagship, most of the key the highlights this time around feel more like refinements of a great phablet than bold steps forward. Cheat Sheet: What's new with the Note 9? 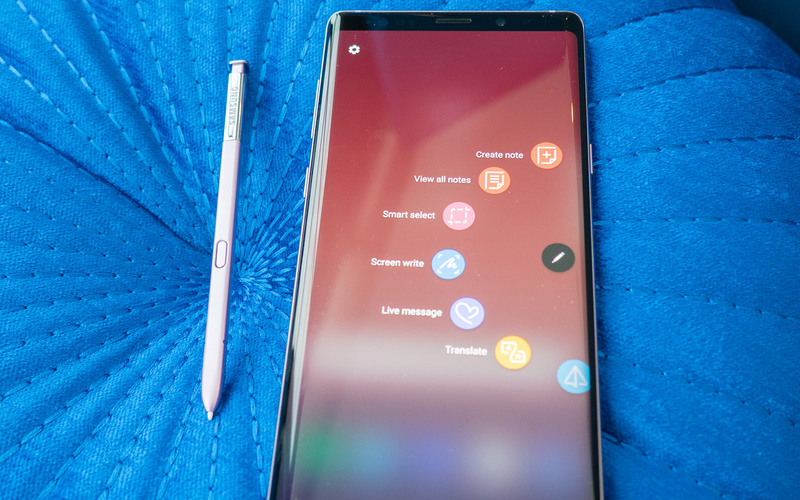 S Pen is a remote control: The stylus now has Bluetooth connectivity so you can use it for taking selfies, giving presentations, skipping music tracks and more. Huge battery: The 4,000 mAh battery is the biggest ever in a Samsung handset, which is a big step up from the Note 8 and its 3,300 mAh power pack. AI camera: The dual camera on the Note 9 can automatically recognize more than 20 different types of scenes (food, plants, etc.) and adjust the settings to get the best shot. Water cooled. 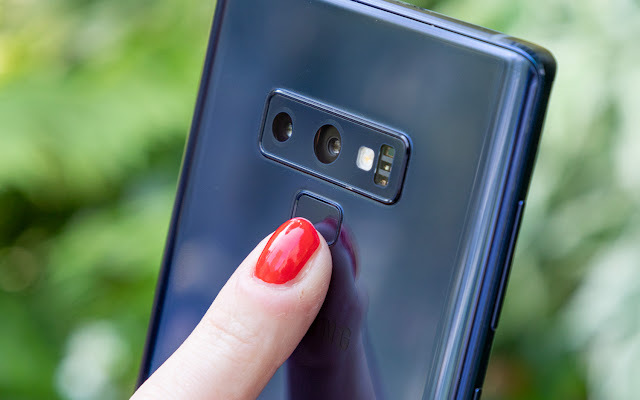 The Note 9 uses a "water carbon" cooling system to prevent overheating and deliver sustained high performance, though our testing didn't yield impressive results. The Galaxy Note 9 will be available for pre-order Aug. 10 and go on sale Aug. 24. It starts at a fairly steep $999 for the 6GB model with 128GB of storage. AT&T, Sprint, T-Mobile, U.S. Cellular, Verizon Wireless and Xfinity will carry the device. You’ll also be able to get it through Amazon, Best Buy, Costco, Sam’s Club, Straight Talk Wireless, Target, and Walmart as well as Samsung.com. The 512GB Galaxy Note 9 will cost $1,249 and will be sold through select retail locations and online via AT&T, T-Mobile, Verizon, U.S. Cellular and Samsung.com. No black or silver here. The boldest thing about the Note 9's design is that it now comes in two vibrant hues. From what we've seen the deeper Lavender Purple model pops more than the Ocean Blue version. However, the Ocean Blue comes with a yellow S Pen, which writes in yellow on the display in Screen-Off memo mode, a nice, subtle touch. If you can tell the Note 8 and Note 9 apart at a glance, kudos to you: The differences between them are so slight as to be imperceptible. 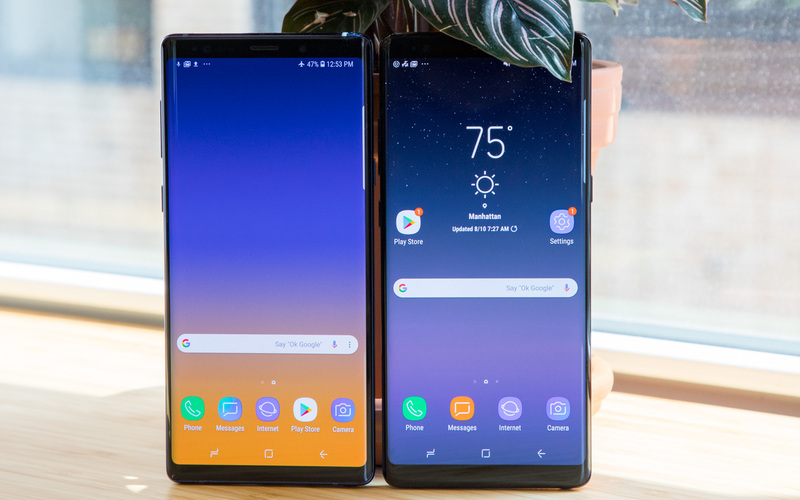 The Note 9 and Note 8 have identical bodies — both are 6.4 inches long and 0.34 inches deep. The Note 9’s display is a smidge larger at 6.4 inches to the Note 8’s 6.3-inch panel, which makes it the largest screen Samsung’s ever put in a Note device, but you’d be forgiven for not noticing. The Note 9's body has more of a flat feel in the hand with chamfered edges, as opposed to the more rounded chassis of Note 8. The new phone is a tiny bit heavier than the Note 8 (7.1 ounces versus 6.9 ounces), but I couldn’t feel the difference when holding both devices. The biggest change is the fingerprint sensor, which Samsung wisely moved from beside the dual-lens camera to beneath it. This makes it easier for those of us with small hands to easily unlock the phone without straining our stubby fingers. Just be aware that the back of the new phone smudges easily. If there’s one thing Samsung excels at, it’s stunning smartphone screens. The same Super AMOLED panel with a quad-HD resolution that you find in the Note 8 and Galaxy S9 is what you get with the Note 9, but then again, it’s pretty hard to improve upon perfection. I haven’t had time to catch up on the second season of Jessica Jones, which I would prefer to watch on my 55-inch TV in the comfort of my living room. But the Note 9’s screen is massive, and OLED lends itself to deep, rich colors (more than LED panels, which are brighter). Catching up on my favorite Marvel anti-hero series was fully immersive, though I still prefer a TV for my streaming needs. OLED panels are now rivaling LED screens when it comes to brightness, at least when in direct sunlight. That’s definitely true of the Note 9, which hit 604 nits on the light meter in our lab tests. That easily beats the Pixel 2 XL’s 438 nits and the iPhone X’s 474 nits, though the S9+ edged out the Note 9 at 630 nits, and nothing really approaches the LG G7 ThinQ, which can clear 900 nits when you max out is brightness settings. 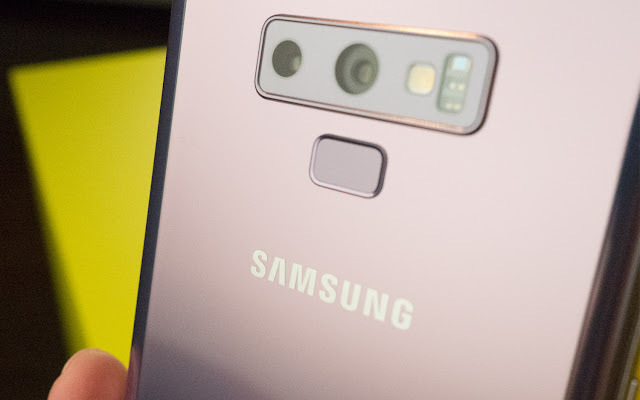 The Note 9 is also incredibly colorful: It reproduces 224 percent of the sRGB color gamut, which is better than the Note 8 (204.8 percent), the Galaxy S9 (220 percent), the Pixel 2 XL (120 percent) and the iPhone X (128.6 percent). But the S9+ proves it has the panel to beat, covering an eye-popping 231 percent of the color spectrum. When it comes to the true-to-life nature of those hues, the Note 9 notched a 0.34 on the Delta-E rating (numbers closer to 0 are more accurate). The Note 8 scored a 0.5. The iPhone X’s OLED panel isn’t quite as rich or colorful as the Note 9’s, but its colors are more true to life with a Delta-E score of 0.27 (or 0.21 when the iPhone’s True Tone setting is toggled on). Overall, the Note 9’s display is one of the best around. At its size and price, it should be. 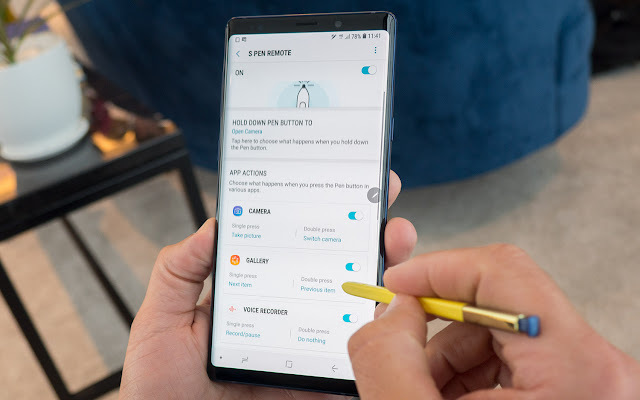 By adding Bluetooth to the S Pen, the Note 9 lets you do things you couldn't do with previous versions of the phone. 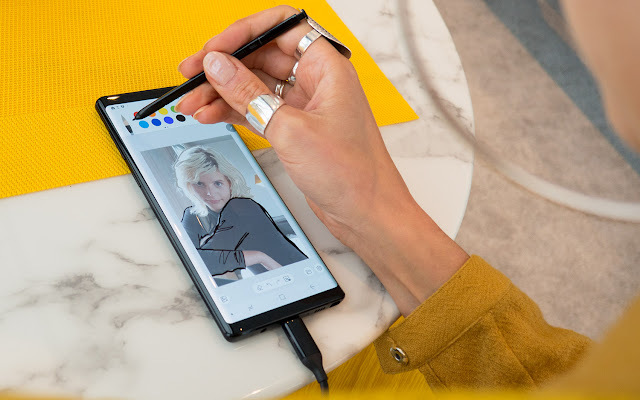 For example, double-tapping the button on the pen fires up the phone's camera, making it easy to hold the Note 9 in one hand while you frame your shot. Pressing the S Pen's button once more takes the shot. 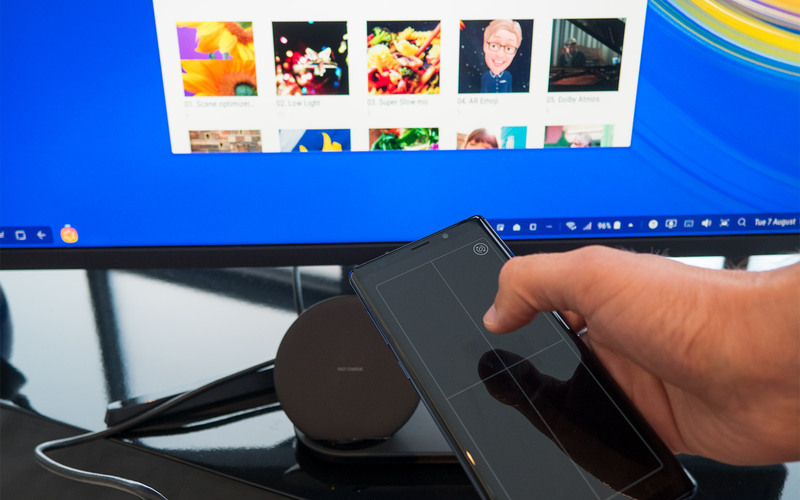 Other tricks include the ability to page forward in presentations with your S Pen (when you're outputting the Note 9 to an external monitor) and controlling music playback from up to 30 feet away. These features worked well in my early testing, and an S Pen settings menu lets you customize what the button presses will do for other Samsung apps, such as Voice Memo. Samsung says it will open up this feature to third-party developers via an SDK. Because the S Pen can do more independently, it needs to be charged via an internal supercapacitor, which takes just 40 seconds to juice up after inserting it into the Note 9. 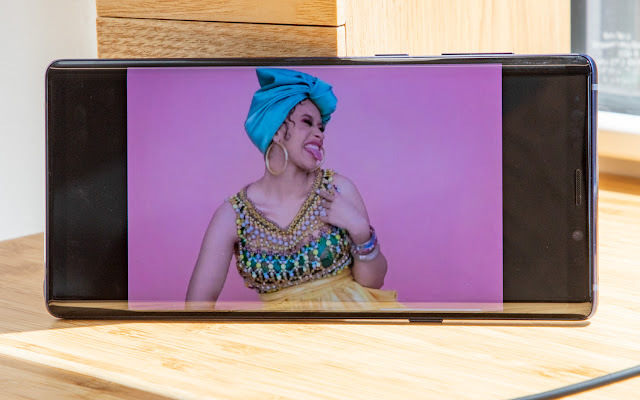 The Note 9’s rear camera is essentially the same 12-megapixel dual-lens shooter Samsung put in the Galaxy S9+, which means you can capture portraits with blurred backgrounds. The camera also sports a dual aperture, which can automatically open at either f/1.5 to f/2.4 for brighter low-light images or crisper shots, depending on your shooting conditions. But Samsung added artificial intelligence to the Note 9’s camera software to set it apart from the other Galaxies. And it really makes a difference. The good news: The Note 9’s Scene Optimizer takes your photos to the next level compared to images shot without the feature turned on. In each photo we took, Scene Optimizer increased the contrast and saturation significantly, which made almost every photo look better. 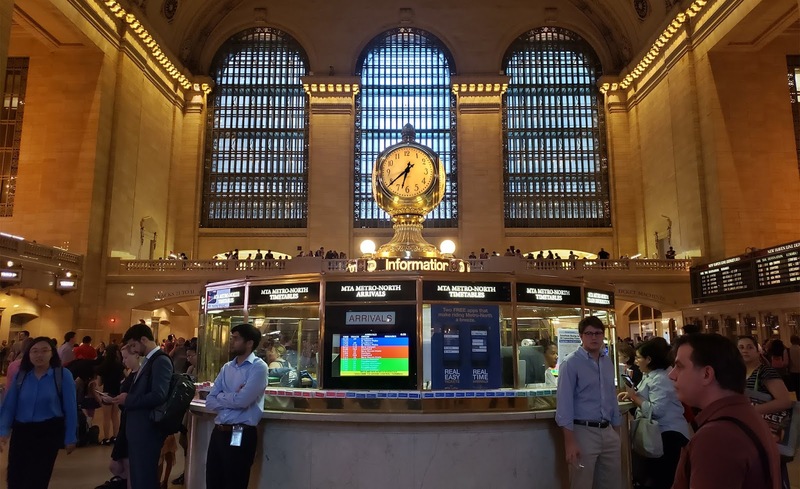 For instance, a dimly lit shot of the gold clock in the center of Grand Central Station looked more vivid with the AI setting, which categorized the train station as nighttime. (An icon appears on-screen in the camera preview to tell you when the Note has recognized the scene type.) The gold clock gleamed in contrast to the window behind it, like a scene out of a Harry Potter film. In a photo of foliage in Bryant Park, Scene Optimizer brought out the details in the leaves cascading over the planter. The pink petals were more sharply contrasted against the shrubbery in the AI-assisted image. But sometimes the AI camera goes overboard, like in a photo of a cinnamon-filled pastry. The twisted dough appeared almost orange in the photo, which the camera recognized as food, and the image was overall flat. The pastry’s sheen was more accurately captured in the non-optimized image, and you could see the rivers of cinnamon more clearly. 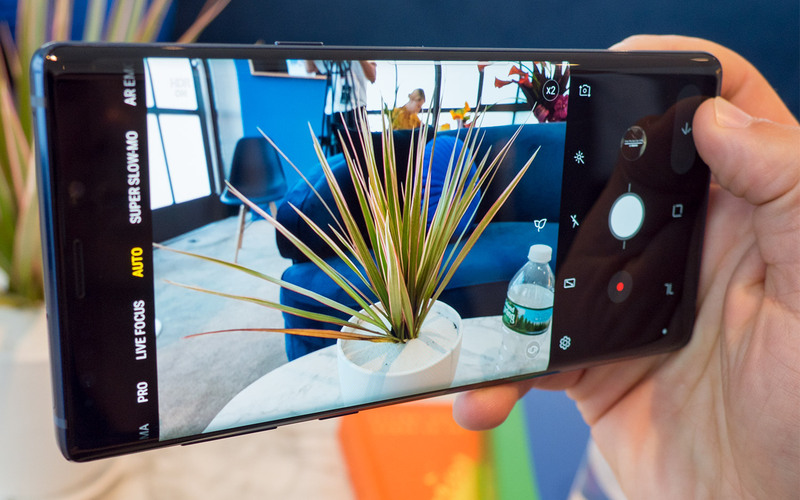 Now, the bad news: Even with AI, the Note 9’s camera still falls short of Google’s Pixel 2 XL, our favorite camera phone. In a photo of backlit buildings in midtown Manhattan contrasted against a lawn filled with people relaxing after work, the Pixel captured the shade variation in the sky and the light reflected in the building windows, and more accurately painted the deep green trees. In a photo of me taken using Pixel’s Portrait mode and the Note 9’s version of Portrait mode, called Live Focus, the Pixel picked up the freckles on my shoulders and the detail in my face more than the Note 9, which smoothed out my skin but made it looks cooler than it is in real life. The Note 9 has one smart feature that other AI-assisted cams don’t: Flaw Detection. This feature tells you as soon as you snap a pic if something is wrong with it. The camera recognizes if a subject is blinking, if there’s too much blur, if your lens is smudged, or if the image is backlit, so you can quickly reshoot at the moment instead of cursing yourself afterward. This really worked — we were able to reshoot a blurry portrait that, at first glance, seemed perfectly fine. Overall, the Note 9’s camera is solid, but it’s not the best around, even with Scene Optimizer activated. However, being able to ditch AI and shoot in Pro mode when you want to is a nice touch for professional photogs who don’t need a boost. 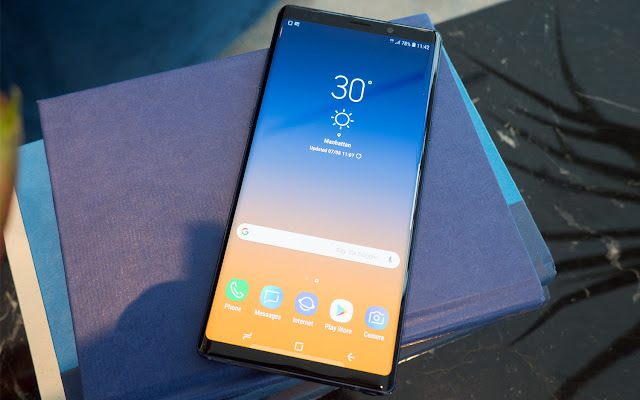 Like all Android flagships these days, the Galaxy Note 9 packs a Snapdragon 845 processor, but Samsung ups the ante with 6GB of RAM on the standard configuration of the phone, which also offers 128GB of storage. If you want more memory and storage, you can order a Note 9 with 8GB of RAM and a whopping 512GB of storage. But that's not the most exciting part. Samsung says it's employing carbon water cooling so the Note 9 can deliver faster performance over extended periods without throttling, such as when you're playing games. There's a 3x bigger thermal spreader (or heat sink) for better cooling performance. We put that to the test — four tests, to be exact — to see how the water cooling feature performs in real life. The verdict: It doesn't. 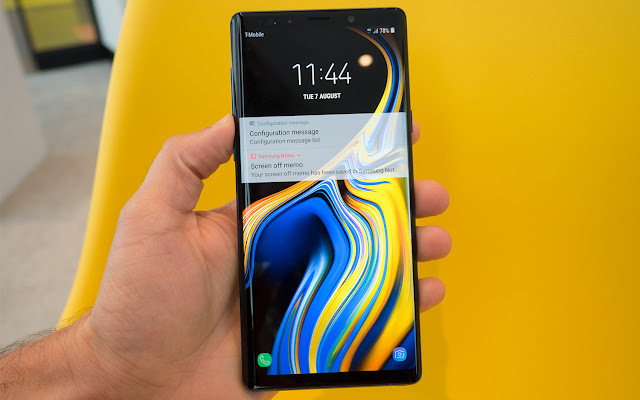 There was no noticeable temperature difference between the Note 9 and Note 8, which has a smaller thermal spreader and lacks carbon water cooling. We reached out to Samsung for comment on our results, and we'll update this review if they respond. 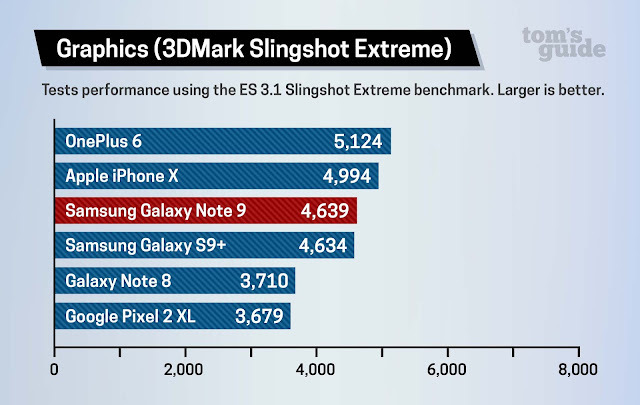 In terms of how that translates to performance, our test results prove the Note 9 is indeed a powerful phone, though not the fastest Android device around. We ran Geekbench 4, which measures a phone's general performance, on the 6GB version of the Galaxy Note 9 and came up with a multicore score of 8,876. 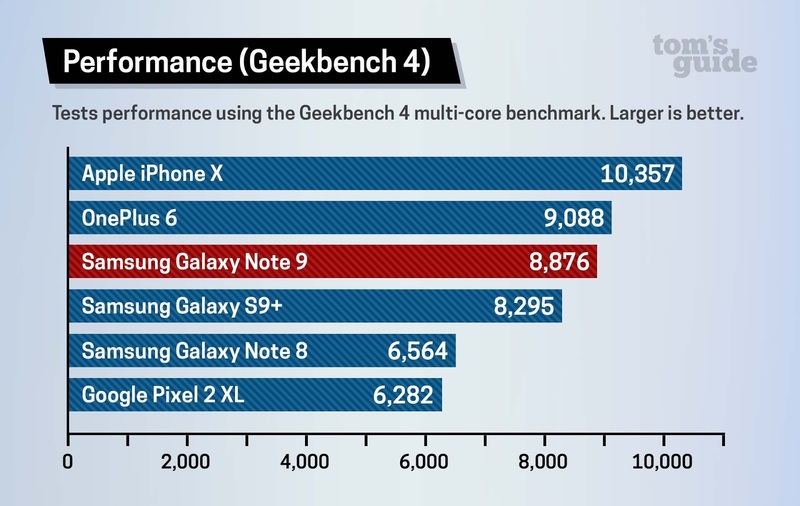 That's a definite improvement over the Note 8 and its Snapdragon 835 processor, which produced a 6,564 score, and the Note 9 outperformed the Galaxy S9+ (8,295) as well. But the Note 9 didn't match the OnePlus 6 model with 8GB of RAM remains the fastest Android device, with its 9,098 scores. We haven't tested the 8GB model of the Note 9, which comes with 512GB of storage and costs $1,249, but it's possible the more expensive Note can rival the OnePlus 6. When it comes to graphics performance, the Galaxy Note 9 pulled ahead of the Galaxy S9+ on 3DMark's Slingshot Extreme 3.1 benchmark with a score of 4,639 compared to 4,634. 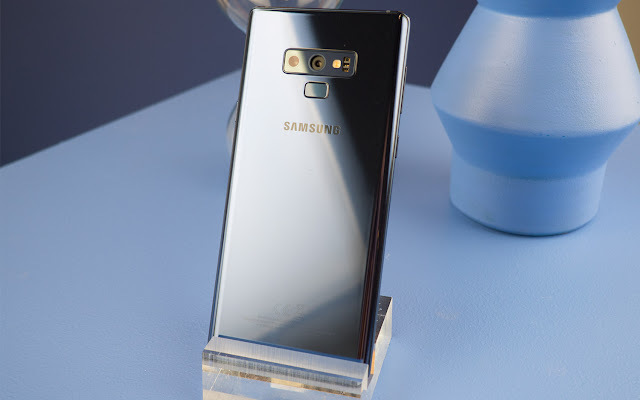 However, the Note 9 lagged behind the iPhone X (4,994) and the OnePlus 6 (5,124) with 8GB of RAM. The Note 9 should offer some of the fastest LTE speeds around, as it sports a Cat 18 modem from Qualcomm. This is the same modem in the Galaxy S9 that ran circles around the iPhone X on downloads and uploads, but we'll put the Note 9 through its paces to see if it achieves the same speeds. It's easy to see why Samsung played it safe in the Note 8 with a 3,300 mAh battery, given the issues with the smokin’ Note 7, but the Note 9 squeezes in a honking 4,000 mAh battery for serious endurance. Samsung says the Note 9's battery has undergone the same eight-point safety check as the batteries in its other recent phones. The Note 8 lasted a little more than 11 hours on our web- surfing battery test. That's slightly better than the Galaxy S9+ (10:59), but the Note 8 was still a ways behind the Pixel 2 XL (12:09). At any rate, we're interested to see if the Note 9 could move toward the head of the pack on our longest-lasting phone list. After a less-than-stellar debut on the Galaxy S8, the Bixby personal assistant has improved with subsequent Samsung releases. 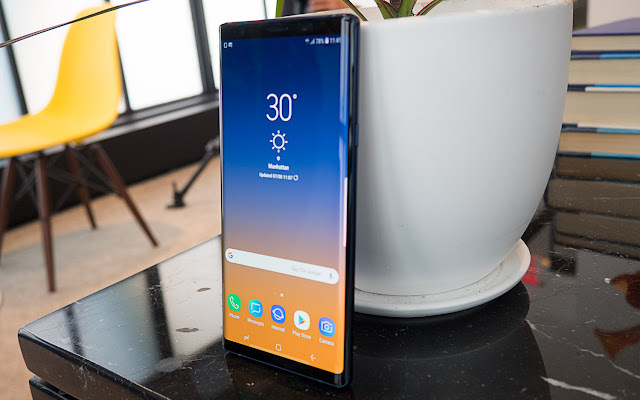 Samsung is hoping that the momentum continues with the Note 9, which ushers in some more enhancements. This version of Bixby should be better able to understand the context: ask it about events happening during the upcoming Labor Day weekend, and the assistant should be smart enough to know that includes Friday, Aug. 31. Bixby can also make reservations, and it now integrates with apps such as Yelp, Google Maps, Uber, and others. So you can order a car without having to touch the Uber app, for example. We'll need to put the new version of Bixby to the test to see if Samsung has truly delivered a more useful assistant, and we're especially eager to see if response times have been sped up as promised. Samsung still needs to justify why we should use Bixby instead of the perfectly fine Google Assistant that's also widely available. The Galaxy Note 9 has very narrow bezels, but it's not a true full-screen phone like some of its Chinese competitors, such as the Oppo Find X and Vivo Nex S. Nor does the Note 9 let you unlock the phone with an in-screen fingerprint sensor, which is becoming more popular. And while Samsung may be working on a better answer to Face ID for a future handset, the Note 9 uses the same imperfect combination of iris and face scanning that the Galaxy S9 does. If you're looking for Android Pie and the new gesture-based navigation system and other AI goodies it brings, you'll have to wait, as this phone runs Android Oreo 8.1 out of the box. Lastly, it's worth noting that 5G-capable phones should start rolling out by mid-2019. Samsung can't do anything about that with this phone, as the modems and networks simply aren't ready yet. But if you're investing $999 in a handset, some may want it to be more future-proof. 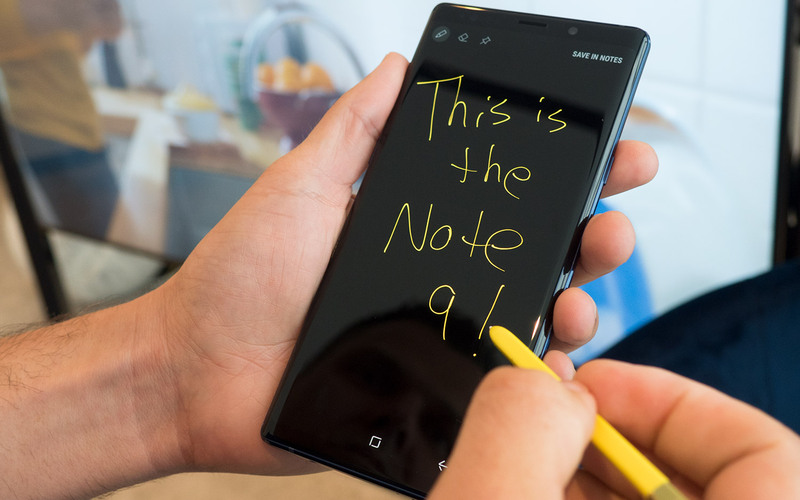 Priced at $999, the Galaxy Note 9 is not a phone that wows. It's simply a more powerful and versatile version of what has been the best big-screen Android handset on the market. And that’s nothing to apologize for. The bigger battery and AI camera alone will likely be enough to entice those who have a flagship phone that's two or more years old. And the water cooling should prove handy for gamers who want to play Fortnite for Android without their hands starting to sweat in battle. The S Pen's remote-control tricks seem like a novelty for now, but I can see people using that capability for taking selfies and maybe giving presentations in DeX mode. The problem for Samsung is not what's on this phone but what's coming. The Galaxy S10 is around the corner for early 2019, and that device is rumored to have cutting-edge features like an in-screen fingerprint reader. Then there's Apple's trio of new iPhones launching just a month from now — including a potentially huge 6.5-inch iPhone X Plus — as well as Google's new Pixel 3 phones in October that will have Android Pie built in. So, unless you love the idea of using an S Pen, you may want to wait until this fall to compare all of the latest flagships before you buy. But if you need a big-screen phone right now, the Note 9 should not disappoint.